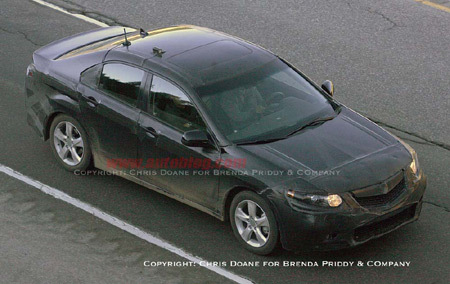 Chris Doane has finally caught the 2009 Acura TSX outside of a Honda facility in the U.S. It would appear the car is about the same size as the current model, or perhaps slightly larger. From the rear it looks like those fender blisters give the car a wider track. The design will reportedly get more aggressive, which you can already see on the nose of this test vehicle despite the liberal application of tape by Honda engineers. Early this morning, not far from Honda’s U.S. falicities, we were lucky enough to get a quick glance at the next generation Acura TSX. The new TSX will take on a more aggressive look, taking design cues from the SPORTS 4 concept car shown at the 2005 Tokyo Motor Show. An improved 2.4L i-VTEC 4 cylinder motor will go into the base model with an expected 20-30 horsepower bump. The entry level model will sport either a 6 speed manual, or 5 speed auto, and will be front wheel drive. A hotter Type-S model should also appear with power coming from the 260hp turbocharged motor also found in the Acura RDX. A hotter Type-S model should also appear with around 260hp coming from an up-tuned version of the 2.3L turbocharged motor found in the Acura RDX. The sportier model will feature a 6 speed auto/manual DSG gearbox, and is expected to feature Honda’s Super Handling All Wheel Drive system. While this vehicle will be sold as the Acura TSX in the United States, this same car, with just a few minor styling adjustments, will also sell in European markets as the new Honda Accord. With the 2008 Honda Accord getting a diesel motor, it is possible that we could see a diesel TSX as well. Look for the TSX to start production towards the end of 2008.